While Automatic Identification Systems (AIS) go a long way towards increasing vessel safety and helping to prevent vessel collisions, many boaters also like to use radar for detecting vessels and other floating objects such as aids to navigation that do not have an AIS transponder. Multifunction chartplotter displays have allowed you to overlay radar and AIS on a navigation chart for some time but these systems tend to be fairly expensive and can require complicated wiring scenarios to accommodate integrating a modern radar with the chartplotter and the AIS system. A new solution from TIMEZERO aka Nobeltec now allows you to combine charting, AIS and radar on an Apple iPad. 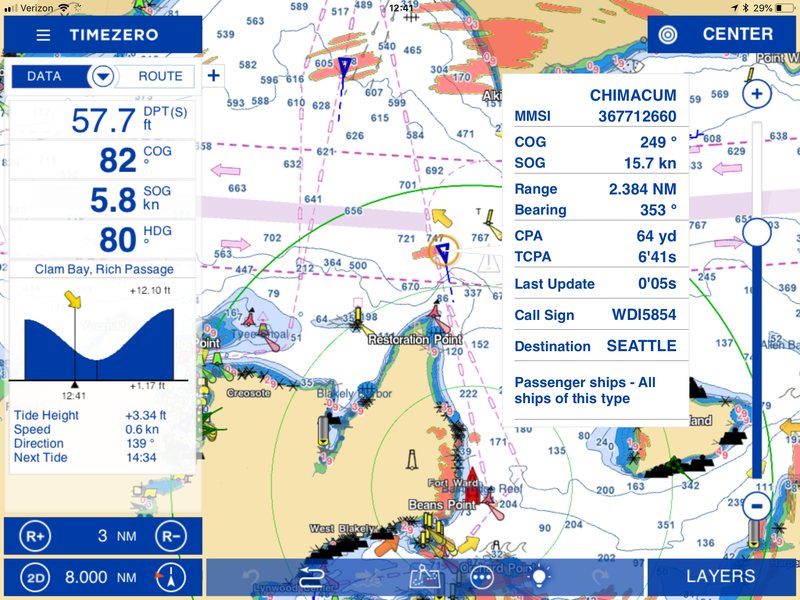 TZ iBoat is the latest version of TIMEZERO’s mobile app for iOS and this version adds some new unique capabilities for iPad-based navigation. The version works with the FURUNO 1st Watch Wireless Radar solution which itself is a unique product that allows a wireless radar system to be used with an iPad. The FURUNO product supports its own radar app which is ok but it only shows radar imagery and no overlay on a chart. The TIMEZERO folks have leveraged their relationship with FURUNO to allow the 1st Watch Wireless Radar to also be used with their app. The TIMEZERO app has also supported AIS overlay for some time. So is it possible to have iPad-based charting, radar overlay and AIS overlay all in one app? Yes it can be done and we took the systems out to test on our own boat to see how to make it all work and what it was like to use. TZ iBoat running on a standard iPad is the application we used. It features both 2D and 3D chart views, routing, weather, tides and currents info and now supports both raster and vector charts. It supports connecting to wireless devices via the iPad WiFi connection. If your wireless datastream includes depth, temperature and wind data, iBoat can display that info as well. Vesper XB-8000 AIS Transponder with WiFi was used as the AIS and GPS data source. 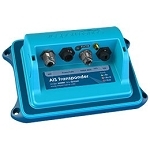 This product, which has been our most popular AIS transponder for several years, is much more than just an AIS Class B transponder. It also has a very power multiplexing capability allowing you to take marine data from your NMEA 2000 network and NMEA 0183 interfaces and multiplex it into a single datastream which can be used by devices connected via WiFi or USB. In our case, I have depth, wind and heading data available on my NMEA 2000 network and this data was combined with the native AIS and GPS data on the XB-8000 and sent over WiFi to my iPad. iOS apps that know how to interpret this data (such as TZ iBoat), can display the information in the app in the form of overlays and digital text. 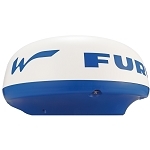 FURUNO 1st Watch Wireless Radar is probably the easiest radar system to install on the market. Basically mount the radar and connect the power leads to your vessel’s 12-24 volt DC system and you’re ready to add an iPad. 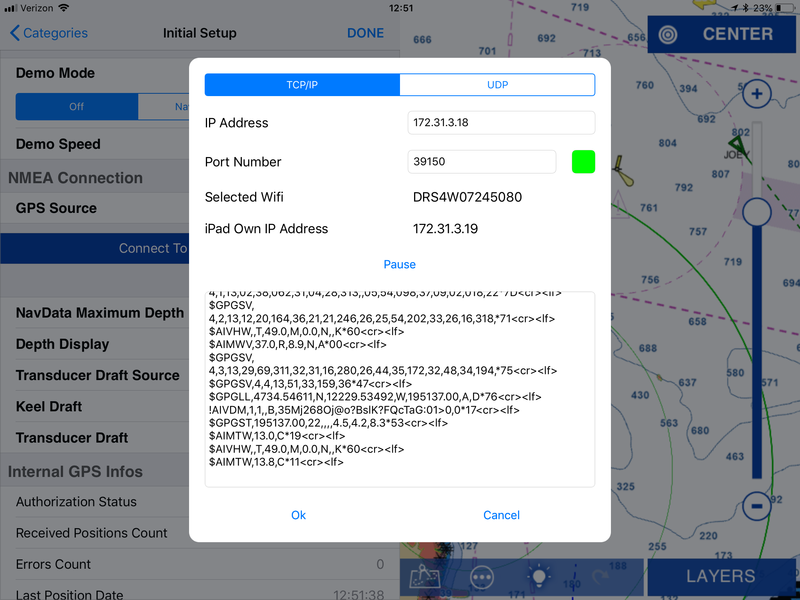 By default, you download and install the FURUNO Marine Radar app, connect to the WiFi network broadcast the radar hardware, fire up the app and you have a radar screen on your iPad. 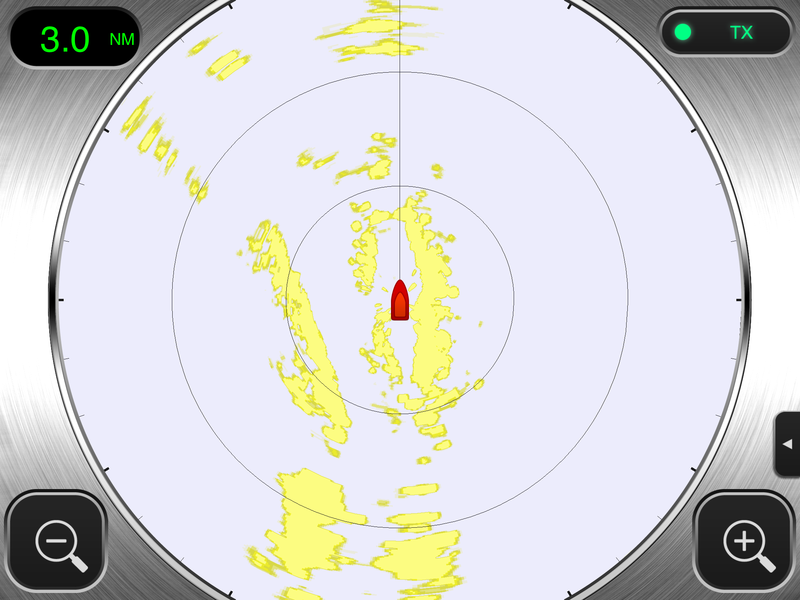 But as mentioned above, the Marine Radar app (screen shown below) does not overlay radar imagery on a navigation chart. For that, you need TZ iBoat. The first challenge in getting all three products working together is to get them all talking on the same WiFi network. By default the Vesper XB-8000 sets up its own WiFi Access Point mode network with an SSID starting with VesperXB-XXXXXX with the Xs being the serial number of the unit. If you were just using the XB-8000 with iBoat or any other supported app, you would join the iPad to the WiFi network being broadcast by the XB-8000 and configure your app using the default IP address and port. However, the FURUNO 1st Watch Wireless Radar also sets up its own WiFi Access Point mode network with an SSID starting with DRW4WXXXXXXXX. The iPad can only join one wireless network at a time so some configuring is required to get both the radar and XB-8000 on the same network. Install the vmAIS program and the USB drivers if needed on a Windows or Mac computer. Connect the XB-8000 to the computer using the USB cable and run the vmAIS app and connect to the XB-8000 using the USB port shown in the connection drop down list. Make sure you are connected to the XB-8000. The top of the application window should say something like “Status: Connected to USB Serial Port (COMxx) …”. Your programmed vessel data should be displayed and the Status tab should show the unit working properly. Uncheck the “Configure as an Access Point” checkbox and click on the Scan button. If your FURUNO Wireless Radar is on, you should see a network name starting with “DRS4W….”. Click on that network to join it and enter the password provided on the installation sheet included with your radar. Once you have joined the FURUNO network, click on the arrow to the right of the network name and your new IP address and port should be displayed. The IP address is a new address assigned to the XB-8000 by the DHCP server built into the radar. The port number should be the default Vesper port of 39150. Write down these two numbers as you will need them when you setup TZ iBoat. With all of this installed on your iPad, it is now time to configure the TZ iBoat app to use the network data. First, make sure your iPad is connected to the FURUNO “DRS4W…” network using the iOS Settings->Wi-Fi configuration screens. Enter the FURUNO WiFi password when prompted. Make sure you are connected. iOS may show you connected but with no Internet. That is fine. Select the menu icon on the top left of the TZ iBoat screen. It is three horizontal lines. Select “Initial Setup” from the list. Select “Connect To NMEA Gateway” which will bring up a network configuration window. Type in the information you saved earlier into the “IP Address” and “Port Number” fields. Once this is done, you should start to see NMEA data streaming in the output window with “$GP…” and “!AI…” sentences. You should also see the RED box beside the “Port Number” field turn GREEN. Go back to the “Initial Setup” screen and now select “GPS Source” and select “NMEA Gateway” and then “DONE”. To configure the radar, simply select the LAYERS button on the bottom right of the TZ iBoat app and select “Chart + Radar” at the top of the window. Make sure the radar is on and is found. There are various radar controls on the bottom left of the screen as well. Also make sure the “AIS Targets” switch is on. You should be all set. Try zooming in and out both the chart screen and the radar range to make sure you have both AIS targets and radar showing up on your screen. See the FURUNO 1st Watch Wireless Radar documentation for information on fine tuning your radar system. That completes the initial installation process. You should not have to re-do any of the steps once you have finished this initial configuration other than making sure the devices are on and you are connected to the FURUNO WiFi network. Note that in order to use the XB-8000 with the iPad, you will need to have the radar on so that it can also join the network however you do not need to leave it in transmit mode. We have also tested this setup with the AMEC WideLink B600W Class B SOTDMA AIS Transponder which provided the same functionality including the multiplexing of NMEA data. Contact us if you need assistance with this setup. Also be sure to buy your products from us – especially if you require support. We can only continue with these types of free articles if we sell products. Safe boating and as always we welcome feedback from customers who have used these solutions.